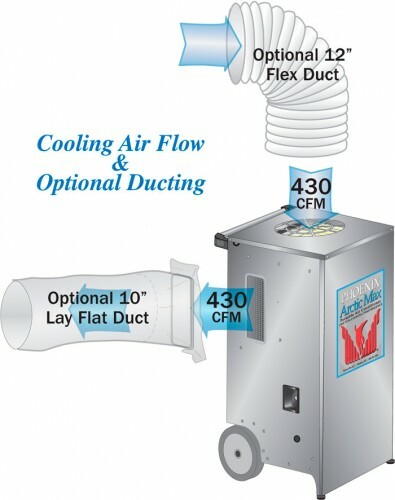 The Arctic Max is the first Portable Air Conditioner designed specifically for the Restoration Industry. 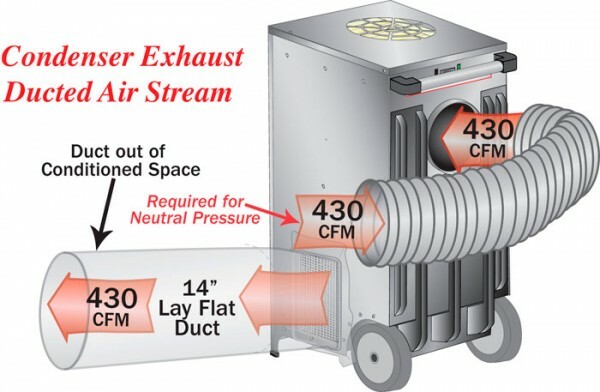 One Ton (12,000 BTUs) of cooling capacity with an evaporator (cooling) airstream of 430 CFM and water removal of 100 pints per day operating in 95ºF/60% conditions. Filter efficiency options up to MERV-11. 11.7 Amps. 115 Volt/60Hz. 142 lbs. Performance In a single pass, the Arctic Max provides a 15-degree temperature drop on the evaporator (cooling) air stream and water removal equivalent to 107 pints per day. The Phoenix Arctic Max gives the restoration contractor vital temperature control in the affected area to optimize drying efficiency or in unaffected areas to safeguard occupant comfort. The Phoenix Arctic Max’s cooling power also makes it the ideal accessory to pre-treat air to improve the performance of desiccant or LGR dehumidifiers. When used in conjunction with the Phoenix Solution LGR performance amplifier, the Phoenix Arctic Max provides a reliable cooling air stream to maximize overall performance. The Phoenix Arctic Max features thermostatically controlled cooling to ensure maintenance of desired conditions and prevent potential over-cooling. The Arctic Max features a stainless steel cabinet for years of service and proven performance. The integrated cart design and recessed wheels make for easy maneuverability, transportation and storage. Setup and operation are simple using the Phoenix window accessory kit and a 15-amp outlet. The Phoenix Arctic Max has an internal condensate pump with 30-foot drain hose and 20-foot power cord.